The Westridge campus is an inspiring, unique collection of buildings and spaces that date from as far back as 1902. The aesthetic and functional qualities of the Westridge campus are inseparable from the school’s identity, and this relationship distinguishes Westridge as a school where learning transcends traditional classroom space and expands the girls’ experience. Our campus stretches across an idyllic park-like setting in a quiet residential neighborhood. The trees, lawns, gardens, and pathways are favorite spots for studying, meeting friends, or enjoying solitude and reflection. Through the decades, we have acquired and maintained contemporary and historic architecture, including Pitcairn House, a craftsman built in 1906 by the influential early 20th Century architects Greene & Greene. In 2010, Westridge completed its most recent construction, the campus' first LEED-certified, environmentally-sustainable facility dedicated to girls studying science and math. We are thrilled to have you visit our campus! Please take a moment to review the information below before you arrive. Questions? Contact us at info@westridge.org. Take CA-2 S to the 134 E towards Pasadena. Exit 13B toward Foothill Freeway/San Fernando. Keep right and follow signs for CA-110/Del Mar Bl/California Bl/Del Mar Blvd. and merge onto I-210 E. Take S Orange Grove to Madeline Dr.
Take I-210 W and keep left to continue on CA-134. Use the right 2 lanes to take exit 13B toward CA-110//Del Mar Bl/California Bl/Del Mar Blvd. and merge onto I-210 E. Take S Orange Grove to Madeline Dr.
Take I-710 N to I-10 E towards San Bernadino. Take exit 22 to Fremont Avenue. Turn right on S Fremont Ave. and turn left onto Columbia St. Turn right onto S Orange Grove Blvd. Turn right onto Madeline Dr.
Take US-101 S to 134 E. Exit 13A for Colorado Blvd/Orange Grove Blvd. Follow S Orange Grove Blvd. to Madeline Dr. Turn left onto Madeline Dr. Between 7:30 a.m. and 3:30 p.m., there is no visitor parking on campus. Please park legally on the street. After 3:30 p.m., guests may park in the parking lot located on Orange Grove and State Street. Please do not park in either the west or east Madeline Drive cul-de-sacs at any time; these areas are reserved for our neighbors. In maintaining a good relationship with our neighbors, we would like those areas to be reserved for their vehicles. Remember to park legally if you must park in the neighborhood. 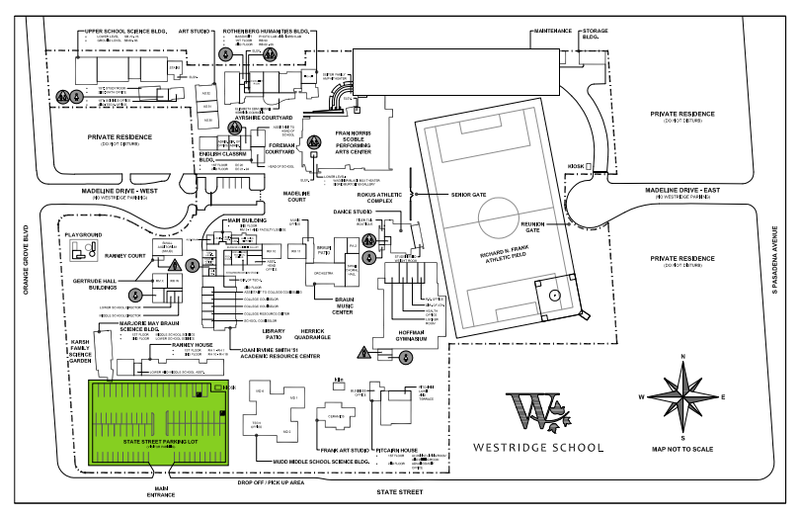 Westridge School is not exempt from Pasadena laws and street regulations at any time! The safety of our campus is very important, so we ask that every guest checks in and receives a vistor pass. Before entering the school, please check in at the security kiosk at the State Street parking lot to receive your visitor pass. Please take a moment to familiarize yourself with our campus by viewing the map below. Highlighted area indicates visitor parking after 3:30 p.m. Click here to download the PDF. Westridge will require that visitor laptops meet the following security requirements. If our security requirements are met, you will be able to gain access to the internet within 15 minutes. Users must have Antivirus software (with malware protection) installed, running and updated before arrival on campus (or access to internet will be denied). Choose the WR Safe Connect WIFI network. Open a new browser to access Internet. Click on request visitor pass link. Fill out and submit form (be sure to enter email address and phone number correctly). You will receive login information via text message and email within 10 minutes. The following additional steps are for Laptops only. Phones and Tablets do not need the steps below. Download Policy Key screen will appear. Install Safe Connect Policy Key. Wait (could be a few minutes) for installation completed screen to appear. When installation completed, Safe Connect will check for updated Virus and Malware protection. Safe Connect will display a warning page in a user’s web browser if a device is found to be out of compliance. Depending on the severity of the issue, the user will either be given time to remediate the problem or access to Westridge WIFI will be suspended until the device is in compliance.